Introduction: Fewer than 100 cases of laryngeal lipomas were reported. Typical clinical manifestations are dysphagia, dyspnea and hoarseness. We visualize endoscopically a mass, that can be pedunculated or not, with a low attenuation on computed tomography. Anatomopathology findings reveal a tumor consisting of mature adipocytes, often encapsulated. Treatment is often surgical, by endoscopic or external approach. It depends on tumor´s size and location. Objective: To report a case of laryngeal lipoma, and present a short literature review. Case Report: A male patient presenting dysphagia and dyspnea. Diagnosis was made by laryngoscopy and diagnostic imaging. It was made an endoscopic excision of the lesion, and it was sent to histopathologic exam. Conclusion: Despite laringeal lipomas are rare and benign, they are important because of being potencial cause of laryngeal obstruction and because they must be differentiated from malignant neoplasms. Lipogenic neoplasms comprehend lipomas which are benign tumors composed of mature fat cells (white adipose tissue or white fat) and hibernomas (benign tumors composed of brown adipose tissue or brown fat), being lipomas the most common ones(1). Laryngeal lipomas are uncommon(2). Less than 100 cases have been reported so far, and most of them are isolated cases and not associated to systemic lipomatosis. Less than 15% of all lipomas affect Head and Neck, and the larynx is the least common area. Lipomas in the larynx might cause airway obstruction(3), what can sometimes be deadly especially if it occurs during general anesthesia induction(4,5). This study presents a case report of larynx lipoma and its diagnosis procedure, therapy and literature review. Intra-operative conclusion shows three distinct injuries, separated by cleavage plans. A 58-year-old male patient, Caucasian, teacher, born in São Paulo city - Brazil. He searched for ENT and Head & Neck service complaining of hoarseness and dyspnea for two months. Videolaryngoscopy exam presented submucosal, rounded, bilobated injury. The largest of them measuring 0.5cm diameter, regarding topography of right arytenoids (Picture 1). Injury presented inclinable movement when inhaling and exhaling, similar to a pedicled component and causing partial obstruction of the glottic gap (Picture 2). The other laryngeal and hypopharyngeal structures remained in normal condition. 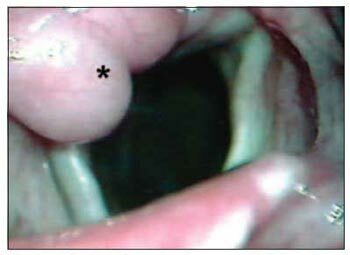 Picture 1 - *Submucosal injury of lobulated aspect regarding topography of right arytenoids. Laryngeal Lipoma. Picture 2 - Injury from picture 1, with a caudal position (*) (patient inhaling), suggesting inclinable movement. Patient was submitted to direct laryngoscopy procedure to biopsy and injury resection. During surgery, a cleavage plan between was found among injuries and laryngeal structures, besides a third lobular injury was found hidden by the other two. After resection, through a microscope, a lipomatosis-like aspect was observed at microscopy. Anatopathological exam showed polypoid lesions cloaked by scamous scaly epithelium composed of mature adipose tissue amongst conjunctive stringer confirming diagnosis of fibrolipoma. Patient developed well after surgery with no complaints. Adipose tissue is a normal component of the larynx, especially in the vestibular fold. Laryngeal and hypopharyngeal lipomas are uncommon(2) firstly affecting male adults(4), and most of them aging between third and fifth decade of life(5,6). The current patient was above average age (58yr)as stated by the literature. Laryngeal lipomas usually occur by themselves either in the supraglottic area or arising from a hypopharyngeal mass(7). The most supraglottic common areas are aryepiglottic fold, vestibular fold and epiglottis(7). In the reported case, the lipoma rose from supraglottis area, more precisely in the arytenoids (Picture 1), and its formation was lobulate-like (3 lobulated injuries). Symptoms consist of dysphagia, dysphonia, acute airways obstruction, hoarseness, voice alteration and sensation of a foreign body presence in the throat(7). The current patient complained of hoarseness and dyspnea. There was a report of mobility limitation of vocal fold by mass effect(8). Symptoms can last from few months to years(7). We could observe the common symptoms as hoarseness, dyspnea for only two months. 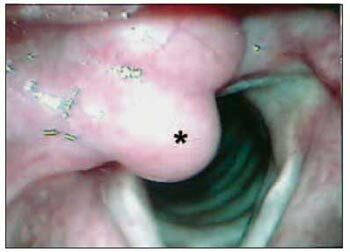 Endoscopic aspect of laryngeal and hypopharyngeal lipomas can vary from a submucosal mass to a polypoid intraluminal projection(7). Diagnosing becomes easy through imaging exam(9). Adipose tissue is low valued in the CT, and it is the only type of soft tissue with lower density than water. Though, CT not only reveals tumor extension, but also it establishes its lipomatous nature. Regarding macroscopic appearance of such injuries, they can be pedicled or sessile, even or lobulated, as the reported case, well traced or encapsulated, by presenting itself as a solitary mass; its size ranges in few millimeters to over 6cm(7). Injuries on the current patient were not bigger than 1cm diameter, though in accordance with mentioned standards. In histological terms, lipomas are encapsulated tumors composed of mature adipose cells. Cells are usually uniform, discretely ranging in size and shape. Such tumors are richly vascularized, though vascular texture is compressed by the distended adipocytes. They can present secondary changes such as hemorrhage, calcification, cyst formation, fatty necrosis and heart attack(10). Laryngeal and hypopharyngeal lipomas can be described into myxolipoma and fibrolipoma(11). The former is composed of a prominent deposition of mucoid substance. The latter is composed of fibrous tissue. These data were observed after a microscopic study of the reported case. It had also been described intramuscular or infiltrative ways(12). Lipoma diagnosis and its variables do not usually present obstacles. The major differential diagnosis is with well-distinct liposarcoma "lipoma-like". The absence of lipoblasts and hyperchromatic nucleus differentiates lipomas from liposarcomas(13). Surgery approach is the therapy for all histological-type lipomas of larynx and hypopharynx. Tumors of small dimension can be removed through direct laryngoscopy under microscopic vision, as it was performed on the patient of this study. Larger tumors might require an external approach (Lateral pharyngotomy, laringofissura, sub-hyoid faringotomia). Regardless of the surgical approach, excision of tumors should be completely done in order to avoid a possible recurrence(7). The current patient is still under observation and has not presented clinical signs of recurrence up to now, even one year after surgery. Laryngeal lipomas are uncommon and benign tumors, though they need a certain importance for being the cause of acute larynx obstruction and also they make part of the differential diagnosis of malignant neoplasm. Surgical therapies, either direct laryngoscopy or external way is able to heal. The anatomopathological study of essential injury differs from malignant lesions, especially the liposarcoma, whose characteristics are easily viewed at microscopy. 1. Enzinger FM, Weiss SW: Benign lipomatous tumours. In: Enzinger FM, Weiss SW (eds. ): Soft Tissue Tumours. 2nd Ed. St Louis: CV Mosby 1998; pp.301-45. 2. Singhal SK, Virk RS, Mohan H, et al: Myxolipoma of the epiglottis in an adult: a case report. Ear Nose Throat J 2005; 84(11):728-34. 3. Taff ML, Schwartz IS, Boglioli LR: Sudden asphyxial death due to a prolapsed esophageal fibrolipoma. Am J Forensic Med Pathol 1991; 12:85-88. 4. Barnes L, Ferlito A: Soft tissue neoplasms. In: Ferlito A (ed. ): Neoplasms of the Larynx. London: Churchill-Livingstone 1993; pp. 265-304. 5. Lewin KJ, Appelman HD: Tumors of the esophagus and stomach. In: Atlas of Tumor Pathology. 3rd ed, fascicle 18. Washington, DC: Armed Forces Institute of Pathology 1996. 6. Burdick JS, Seidel R, Lindberg G, et al: Endoscopic removal of an esophageal fibrovascular polyp. Endoscopy 1999; 31:401-4. 7. Wenig BM. Lipomas of the larynx and hypopharynx: a review of the literature with the addition of three new cases. J Laryngol Otol 1995; 109(4):353-7. 8. Yoskovitch A, Cambronero E, Whiteman M, et al: Giant lipoma of the larynx: a case report and literature review. Ear Nose Throat J 1999; 78(2):122-5. 9. Remacle M, Mazy G, Marbaiz E, et al: Contribution of tomodensitometry to the understanding and diagnosis of benign non-epithelial endolaryngeal tumours. Acta Oto-Rhino-Laryngologica 1983; 37:820-9. 10. Napolitano L: The differentiatin of white adipose tissue cells: an electron microscope study. Journal of Cell Biology 1963; 18:663-79. 11. Rozas Aristy F, Durán ME, Zapateiro J: Lipoma mixoide de la laringe. Revista Medicina de Panamá 1991; 16:33-8. 12. Chen KTK, Weinberg RA: Intramuscular lipoma of the larynx. American Journal of Otolaryngology 1984; 5:71-2. 13. Cauchois R, Laccourreye O, Rotenberg M, et al: Intrinsic infiltrating intramuscular laryngeal lipoma. Otolaryngol Head & Neck Surg 1995; 112(6):777-9. 1. ENT doctor - expert in Head & Neck Surgery by HSPE-SP. 2. 3rd yr Resident Doctor in ENT and Head & Neck Surgery by HSPE-SP. 3. ENT doctor - expert in Head & Neck Surgery. Responsible for Laryngology section in the ENT and Head & Neck Surgery Department at Hospital do Servidor Público Estadual de São Paulo. 4. Doctorate student in ENT by FMUSP. Assistant doctor of Head & Neck in the ENT and Head & Neck Surgery Department at Hospital do Servidor Público Estadual de São Paulo. 5. ENT and Head & Neck Surgery doctor. Post-graduation student in Head & Neck Surgery by HSPE-SP. This article was submitted to SGP (Publication Management System) of R@IO on March 31st, 2007 and approved on October 12th, 2007 at 05:30:28.